Vivian Peng took part in C4AA’s 2016 Queens Arts Action Academy, supported by the National Endowment of the Arts in partnership with the Queens Museum. She is a visual artist and activist, and is currently a communications manager at Doctors Without Borders. With a masters in public health informatics from Columbia University, her specialty lies in using design to raise awareness and inspire dialogue on the social and political barriers to building healthy populations. She generously shared some of her story and work with us. Photo of Vivian Peng by Edwin Torres. How did your story begin as a artistic activist? When I started as an intern for Doctors Without Borders/Medecins Sans Frontieres (MSF) six years ago, I was pretty quiet and the team knew me only as a public health grad student, not as an artist. Secretly on my own, I started drawing graphics for our social media messages, and casually showed them to my supervisor. “What do you think of these?” I’d ask, hoping she would post them online. Slowly, my artwork started appearing in our social media feeds and people in the office got to know my creative side. 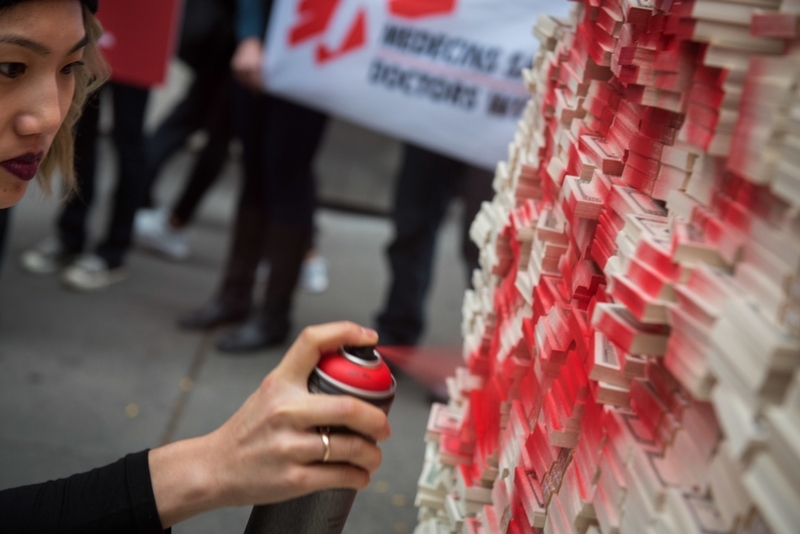 That’s when the Access Campaign, MSF’s advocacy campaign for essential medicines, began to commission my work. It was my first time getting to use my creative skills towards public health causes that I cared deeply about. I was fascinated by how this team of medical staff, lawyers, activists, and journalists worked together to bring about change. Over the years, I continued to work for the Access Campaign and had many opportunities to use art for advocacy. This way of working opened up a whole world of possibilities, and helped me realize my purpose in creating art. How did you come to know C4AA’s work? In my previous position as the digital officer for Doctors Without Borders, I was running a campaign called A Fair Shot. The goal of our campaign was to lower the price of the pneumonia vaccine to $5 per child for all humanitarian organizations and developing countries. One day, we spent a couple hours brainstorming an action for the upcoming World Pneumonia Day, but we felt completely stuck. We tried so many different actions in the past year, it was difficult to come up with new ways to engage our audience and put pressure on the stakeholders. I got back to my desk and literally Google searched “Artistic Activism,” hoping to get some inspiration. The first result that appeared was C4AA’s website. I got lucky, because C4AA had just put out a call for applications to participate in the workshop. I filled out my application immediately. Photo by Edwin Torres of Vivian during an action for A Fair Shot campaign. Now that you’ve been part of a C4AA workshop, do you find yourself using what you’ve learned? What have you used and how did you use it? The best takeaway I got from the workshop was how to take action despite all the unknowns. I think as artists and activists, we often get stuck at the first step–knowing how and when to take action. It’s easy to feel overwhelmed by the gravity of an issue and never take action at all. The workshop was designed in a way in which we had to take action by the end of the 6 weeks of weekend workshops. It was stressful at times, and we often felt like we had no idea what we were doing. But, the feeling of collaborating and building something together was invaluable. I thought it was a great simulation of being an artistic activist in real life. It definitely gave me confidence in my later work, when I often had less resources and time, but I knew we could pull something together. What is a specific project that you’ve done that you thought was particularly successful, or a grand failure? Most successful thing I’ve done was illustrating and placing this bus ad right at Pfizer’s doorstep at their New York headquarters. This ad ran for an entire month, and all their employees passed by the artwork on their way to work. See photo below. I learned how to use physical space strategically. We live in a world in which most things nowadays come “digital first,” and it overcrowds our screens. It’s incredibly difficult to capture someone’s attention online. This artwork was created originally for social media and online use. But I knew I wouldn’t be able to get this artwork to our target audience, Pfizer’s employees, through any online medium. So I started to research how other activists have used physical space and came across a whole body of work on bus ads. In your artistic activist practice, how do you know if what you are doing is working? How do you know if you’ve been successful? There’s a lot of work that goes into preparing for an action. Here’s a worksheet I developed to help with the prep work. 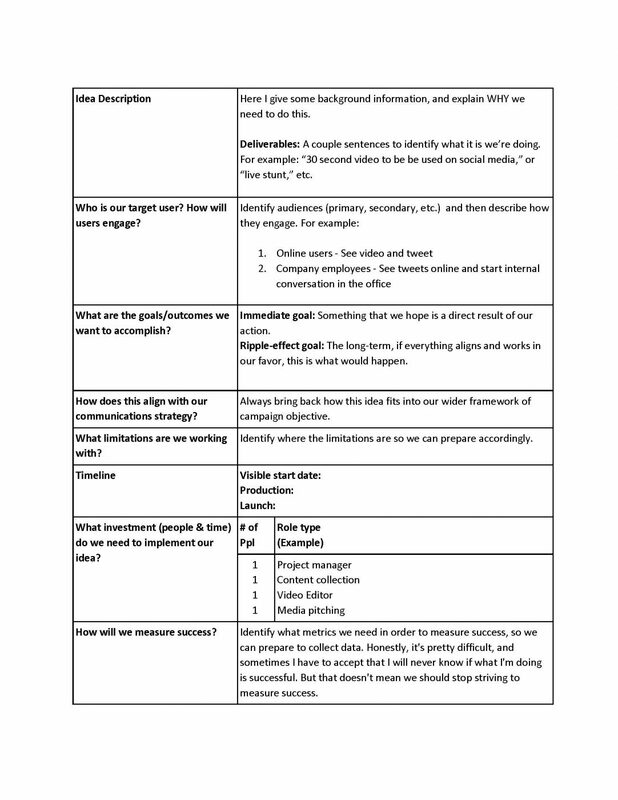 I like to keep it one page long, so we can get a good snapshot on the concept and what we need to measure. What have you done that is “impossible”? 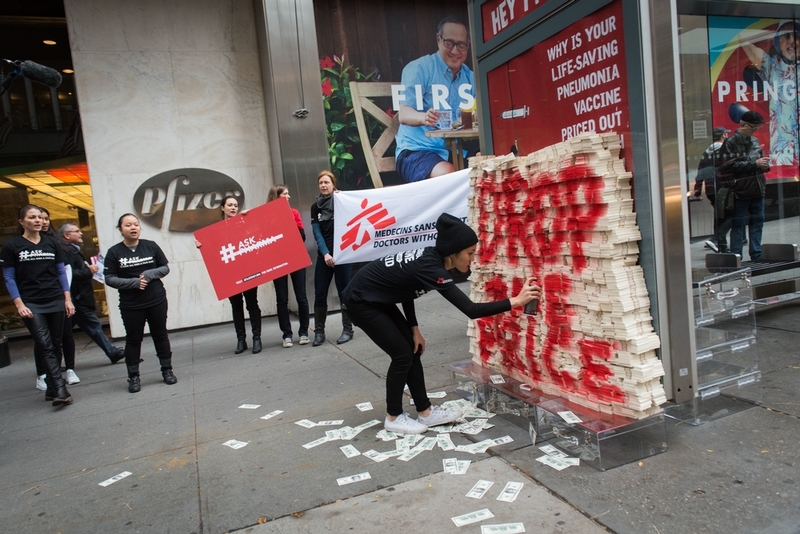 Get Pfizer’s CEO to agree to an unprecedented meeting with Doctors Without Borders Executive Director after 7 years of campaigning. How did you make it possible? 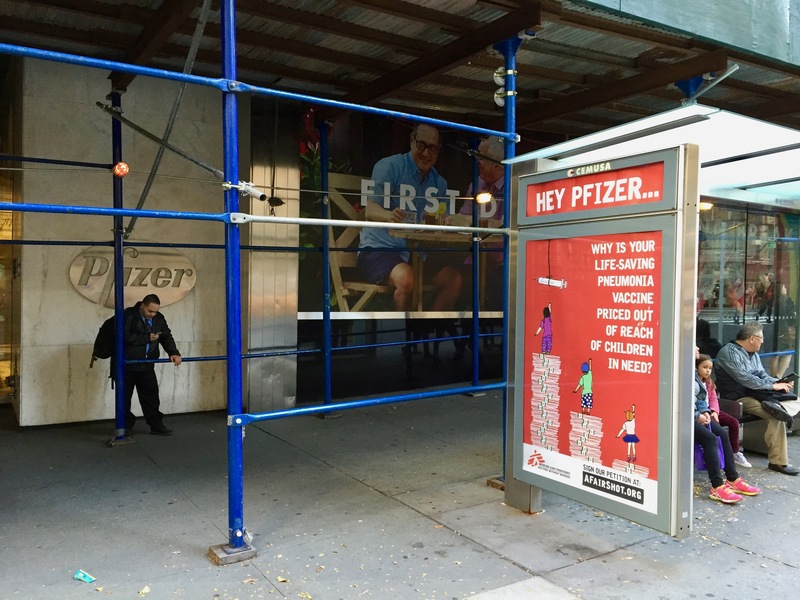 The day before Pfizer’s shareholder meeting, we organized a live stunt where 70+ people slowly and deliberately placed a total of 2,500 flowers into a crib to illustrate the number of kids who die from pneumonia each day. On the crib, we wrote the names of all the people who signed our petition asking Pfizer to lower the price of the pneumonia vaccine. Pfizer accepted our crib, and it sparked a lot of internal dialogue from their employees when they came across this work of performance art. The next day, we attended their shareholder meeting and asked the CEO what he would do to reduce the price of the vaccine. In his response, he mentioned our stunt and casually said that he would be glad to meet with our director. Because he said this in an open forum, we were able to publicly hold him accountable to the meeting. This opened up a direct door to dialogue. After 7 years of campaigning, Pfizer finally agreed to lower the price of the pneumonia vaccine to $9/child for all humanitarian organizations. For context, MSF previously had to pay the equivalent of $204.3/child to vaccinate kids in refugee camps in Greece. This is a huge step towards the right direction, and we are still working to get the price lowered for all developing countries too. What does your Utopia look, feel, sound and smell like? A world in which all humans value the dignity of life. I imagine that it still looks, sounds, and smells like our world today, but I hope it feels much cooler once we truly begin to appreciate and protect our earth. When I’m under an intense deadline and there’s literally no time for doubts–I just have to take action. What advice would you give someone who has been a traditional artist or activist who wants to get into artistic activism? Dare to have hope in the face of extreme adversity. These are dark and troubling times, what keeps you doing the work that you do? I’ve found that where there is darkness, there is light. When I was on mission in Kenya and Myanmar, I witnessed opposing communities transcend differences to help each other. In the U.S., I see all these folks organizing and rallying for justice. As long as there is even a single person willing to work towards a better future, then we have so much to look forward to. I just completed a mission in Myanmar, so I’m in transition at the moment. I’ve spent many years working on global public health issues, and I’m looking to work on domestic causes now.